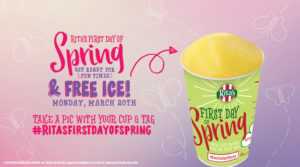 Every year Rita’s celebrates the first day of spring by giving away free Italian Ice. It’s a Rita’s Tradition for over 20 years! So on Monday, March 20th head to Rita’s between noon and 9 p.m. to get your cup of free Italian ice! The limit is one free cup per person, but enter Rita’s First Day of Spring Photo Contest for a chance to win 25 prizes, including the grand prize of free Italian ice for a year.